Kingston, the world’s largest leading manufacturer of memory products has announced the availability of a new addition to it’s HyperX high performance memory with the HyperX T1 Series Dual Channel Memory Kit. The T1 series is in particular designed for the new Intel 3rd Generation i5/i7 Ivy Bridge processors. Available in memory speeds of 1600MHz, 2133MHz and 2400MHz with also 2666MHz variant to launch soon in a couple of days. The rams support Intel’s XMP 1.3 profiles and are available in flavors of 8 and 16 GB respectively. Check out the press release below after the break. (California USA headquarters)is June 4, 2012, for “HyperX T1 Series Dual Channel Memory Kit” that was subjected to special design, which began shipping for the third-generation Core i7/i5 Intel Kingston Technology. 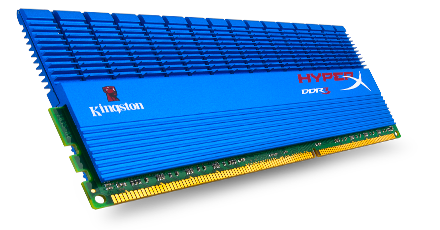 DDR3 dual-channel memory kits ship of five models that belong to the memory “HyperX T1” series top of the Kingston Technology brand has been initiated. Blue anodized aluminum heat spreader is characteristic of comb shape on the exterior of the, “T1” series in the high-end memory module has been developed for third-generation Intel Core i7/i5 series both are installed. Lineup is 1600MHz, 2133MHz, 2400MHz, 2666MHz top is soon to launch further notice. Product certification XMP, there is provided a lifetime warranty and free technical support.